Member States will take part in the High-level Meeting on Disability and Development with the theme: “The way forward: a disability inclusive development agenda towards 2015 and beyond.” While the Millennium Development Goals (MDGs) represent a concerted effort to address global poverty, there is a striking gap in the current MDGs and their inclusion of persons with disabilities. Follow @UN_ENABLE, @WHO, @UN, #HLMDD and #Thisability for updates on Twitter throughout the day. Watch live online. 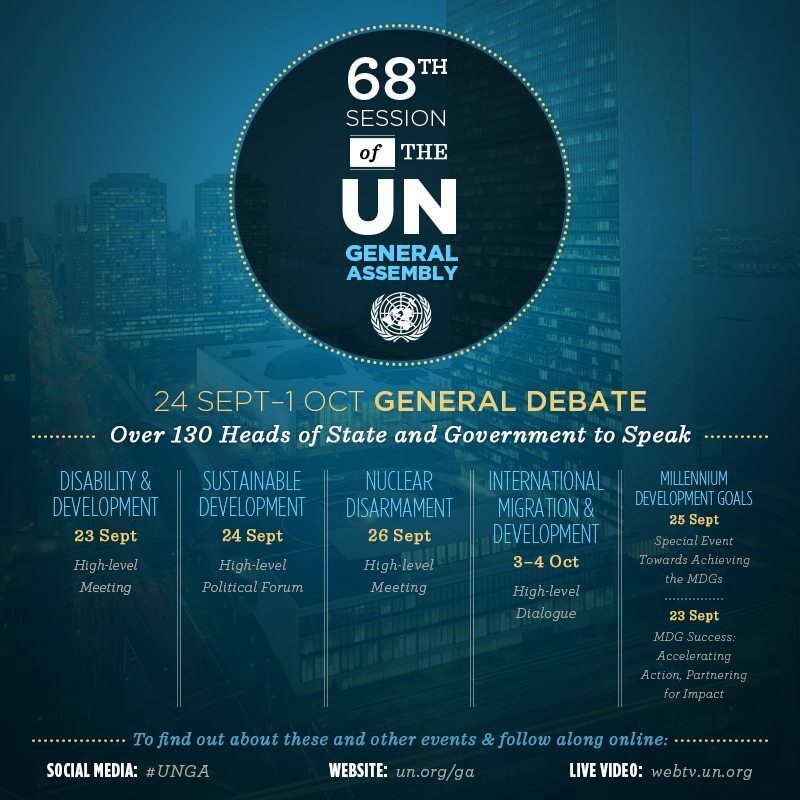 Also on Monday, Heads of State and Government, the President of the General Assembly, business CEOs, philanthropists and civil society leaders, as well as top UN and World Bank leadership will take part in an all day high-level forum to catalyze and accelerate further action to achieve the MDGs. Follow @WeCanEndPoverty, #MDGSuccess for updates on Twitter throughout the day. Watch live online. At 4 pm, there will be an unveiling ceremony for the winner of the UN Slavery Memorial design competition. Meet the judges in the above video. The Memorial will serve as a reminder of the legacy of the slave trade. It will provide future generations an understanding of the history and consequences of slavery and serves as an educational tool to raise awareness about the current dangers of racism, prejudice and the lingering consequences that continue to impact the descendants of the victims today. In another part of New York City, the Social Good Summit continues, joined by meetups in over 120 other locations around the world. Follow #2030now and the live feeds from Mashable. Ahead of October’s launch of the Malala Fund that aims to deliver the power of education to help girls find their voice and unlock their potential, as part of the Social Good Summit Malala Yousoufzai will answer questions on Twitter for the first time ever. She’ll talk about about the Fund and why just one year after she was shot, she is continuing to stand up for girls everywhere. Use #MalalaFund to send questions and tune in at 2:30 pm NYC time at @MalalaFund. This list highlights only a few of the events happening on Monday – follow us on Twitter and Facebook for the latest.